In American Architecture there was often a hybridization of Architectural styles in the late 1800s and early 1900s. This filtered down to the merchandising of interior architectural details that were used, I believe, to create product differentiation. 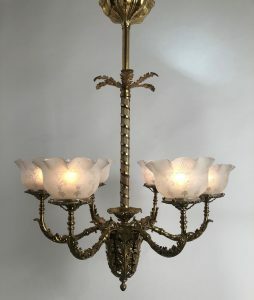 I am often presented with this evident hybridization when asked to suggest what antique lighting fixtures would work in a room. My first handle for placement would be the period of the house and the Architectural style. 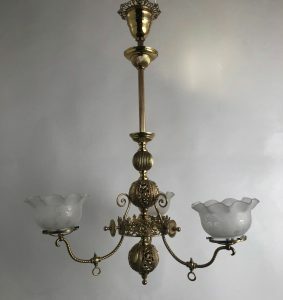 In the early 20th century you will see Colonials with Arts and Crafts details and the manufacturers following with lighting fixtures that could work in either style. I believe it is not so much the intention of the Architect and Manufacturer but more to follow the trends in taste of the individuals they are trying to please. Here are two American fixtures in the Art Nouveau style. One of the characteristics of Art Nouveau is the organic portrayal of flowers and vines. When compared to other periods where the portrayal of the organic material is more realistic the Art Nouveau portrayal of details are more stylized. They are stylized in many ways but here are two. The portrayal of the organic material is set up so the design is not random but set in a scheme that is parallel or perpendicular to create a pleasing pattern. A second within the organic material it loses its randomness so to be allowed to fit in this pattern. Art Nouveau is more of a Victorian sub style in the U.S. as opposed to Europe where it was a movement that resulted in whole buildings being built in the Art Nouveau style. I think this is due to the hybridization of Architecture we see in the period in the U.S., but also, because the style itself works more as an interior accessory. Lighting fixture. Stained Glass window for example.